C++ is the workhorse of programming languages and remains one of the most widely used programming languages today. It's cross-platform, multi-functional, and updates are typically open-source. The language itself is object-oriented, offering you the utmost control over data usage, interface, and resource allocation. If your job involves data, C++ proficiency makes you indispensable. 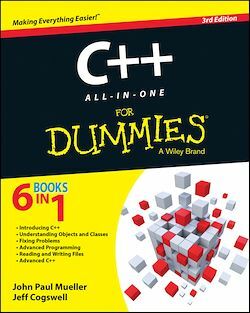 C++ All-in-One For Dummies, 3rd Edition is your number-one handbook to C++ mastery. Author John Paul Mueller is a recognized authority in the computer industry, and your ultimate guide to C++. Mueller takes you through all things C++, including information relevant to the 2014 update. Online resources include source code from examples in the book as well as a C++ GNU compiler. If you need to learn C++, this is the fastest, most effective way to do it. C++ All-in-One For Dummies, 3rd Edition will get you up and running quickly, so you can get to work producing code faster and better than ever.